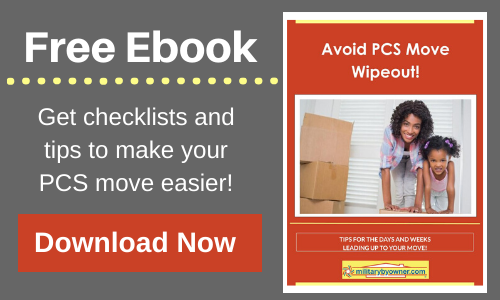 A Permanent Change of Station (PCS) move with short notice can bring lots of stress. We often think too quickly over decisions that require further consideration and may end up making poor decisions. Each move my husband and I have made with the Marine Corps has been short notice. I don’t consider myself an expert or anything of the sort. But we’ve made mistakes and learned a few things! Keep calm! The first thing I want to do is panic. My brain (and emotions) immediately kick into overdrive in an attempt to make up for the lost time I thought we had to prepare for our PCS. I urge you to slow down. Create a list of things that need to be done and schedule a day leading up to your move that you will accomplish each task. Nothing good comes from panicking. Plans that I’ve made while under pressure usually have fallen through. When things do work out, it’s because I have made decisions with a clear head. Have faith that it will work out because it always does, one way or another! Take your time finding a home. During our second move, my husband and I did not use MilitaryByOwner to find our new rental home. I know, I know, shame on us! Instead, we found a community of quaint, brick houses that we thought was just perfect for us. We drove twelve hours to pull up to what we thought was our perfect home. However, we arrived at what can best be described as an abandoned nuclear-war town. It sounds terrible, doesn’t it? It was terrible. The entire neighborhood appeared to be empty, aside from the house positioned directly next to ours, that is. While we have no children, our neighbors had multiple children running through the street and across the yards. To top it off, I could not pull into our driveway because our neighbor had parked his motorcycle on our property. They also parked their cars in the street, blocking the majority of the cul-de-sac. The only saving feature of this house were the Valentine’s Day flowers sitting on the front stoop that my husband had sent to the address ahead of time. All that to say, take your time when you find a new home. Do your research and use MilitaryByOwner as a resource! If you have a difficult time finding a good home prior to your move, use your Temporary Lodging Allowance to set up in a hotel while you find a house. That is what it’s there for! Ask for help! My husband and I have done a Personally Procured Move, or DITY ('do it yourself'), each time we've moved. We have asked our neighbors and friends to help us with loading the large items and, let me tell you, it has made our experience extraordinarily easier. If you let the movers come and move you, you might ask your friends and neighbors to help while you purge household items or sort through what you'll be taking with you. I have found that, if you ask, most people are willing to help in whatever way they can, so let them! I hope that if you have to move on short notice, you're able to stay calm and maintain a clear perspective. And if you have a funny PCS story, please share!